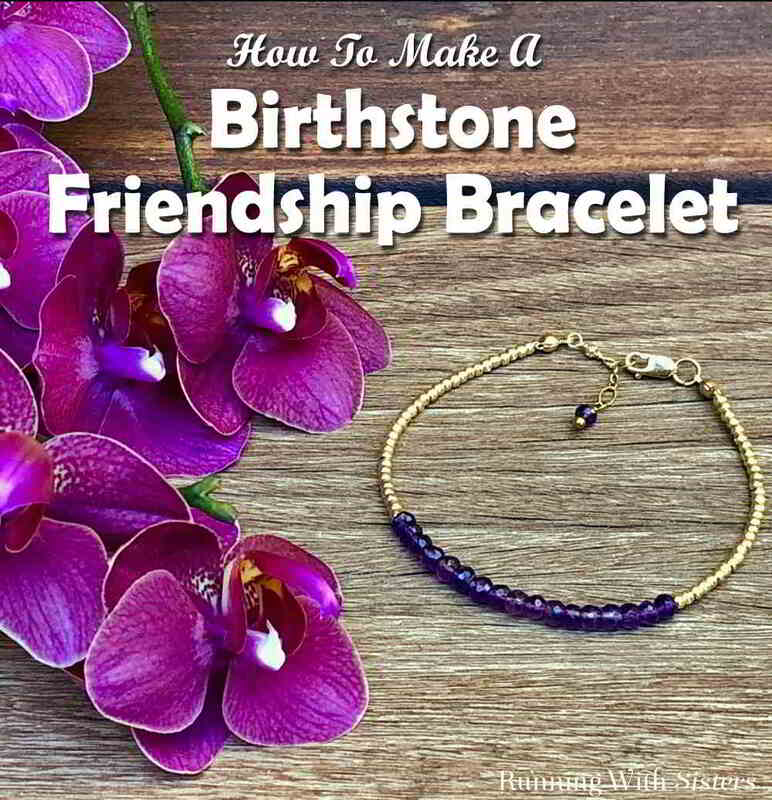 Make A Birthstone Friendship Bracelet with delicate gold beads and real gemstones. We’ll share how to put the bracelet together plus how to add a chain to the clasp to make the bracelet adjustable. 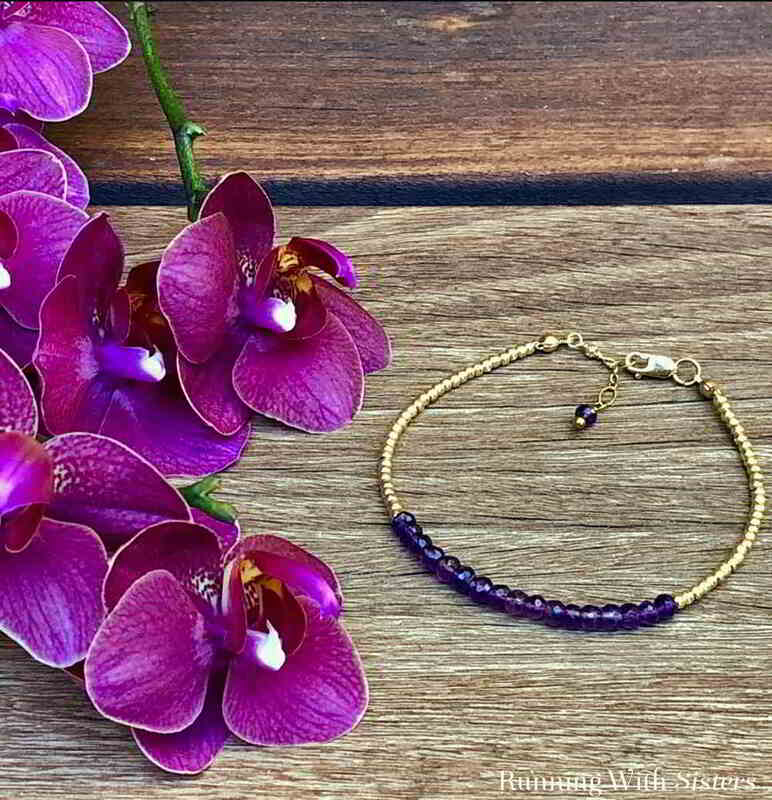 Our Delicate Beaded Friendship Bracelets are one of our most popular projects. (If you missed them, you can see them here.) So we were inspired to make a faceted gemstone version for our friend Beth’s birthday featuring her birthstone, and we love how it turned out. We added a piece of chain to one end of the bracelet to make it adjustable. A great tip when making jewelry gifts! 1. Cut a piece of bead-stringing wire 12 inches long. Place a Bead Bug on one end of the wire, or fold a piece of masking tape over the end to keep the beads from sliding off. 2. Feed on 2 inches of gold seed beads followed by 2½ inches of faceted gemstones. 4. Feed the end of the wire up through the hole in the bottom of a clamshell bead tip, then slide on a crimp bead. 5. Flatten the crimp bead with chain-nose pliers. Trim the wire with wire cutters. Slide the clamshell bead tip up over the crimp bead so the crimp is cupped inside the clamshell. Then press the clamshell closed gently with chain-nose pliers. 6. Open the jump ring using two pliers. To do this, rotate one set of pliers up and the other down to slide the jump ring open while maintaining its round shape. Feed the jump ring through the loop on the clamshell bead tip then feed on the lobster clasp. Close the jump ring. Here’s a video we made showing how to open and close a jump ring this way. 7. To finish the other end, start by removing the Bead Bug or masking tape. Slide the beads down to the lobster-clasp end. Feed the end of the wire up through the hole in the bottom of the other clamshell bead tip, then feed on a crimp bead. 8. Slide the clamshell and crimp bead down against the beads to remove slack. Press the crimp bead to flatten it, then trim the wire. Use chain-nose pliers to gently press the clamshell closed over the crimp bead. 9. To make the bracelet adjustable, cut a 3” piece of 26-gauge wire. Make a wrapped loop in one end of the wire. To do this, grasp the wire one inch from the end with the round-nose pliers. Bend the wire over the pliers 90 degrees. Reposition the pliers, gripping the wire at the 90-degree bend. Grab the end of the wire with your fingers and wrap it around the pliers to make a partial loop. Reposition the pliers so the bottom jaw is in the partial loop. Continue wrapping the wire around the pliers to finish the loop. Slide the clamshell bead tip into this loop. Then grasp the loop flat in the jaws of the chain-nose pliers. Pull the end of the wire around the neck below the loop two times. Trim the end. Slide a gold seed bead onto the wire. Then make another wrapped loop through the last link of the chain. 10. To add a bead-dangle detail to the end of the chain, slide a faceted gemstone onto the headpin and make a wrapped loop through the last link of the chain. How gorgeous did this turn out?! We plan to make two more with faceted emerald rondelles to give to each other. Both May birthdays! How did you get the gold materials? Where from? We buy lots of beads and findings from them.